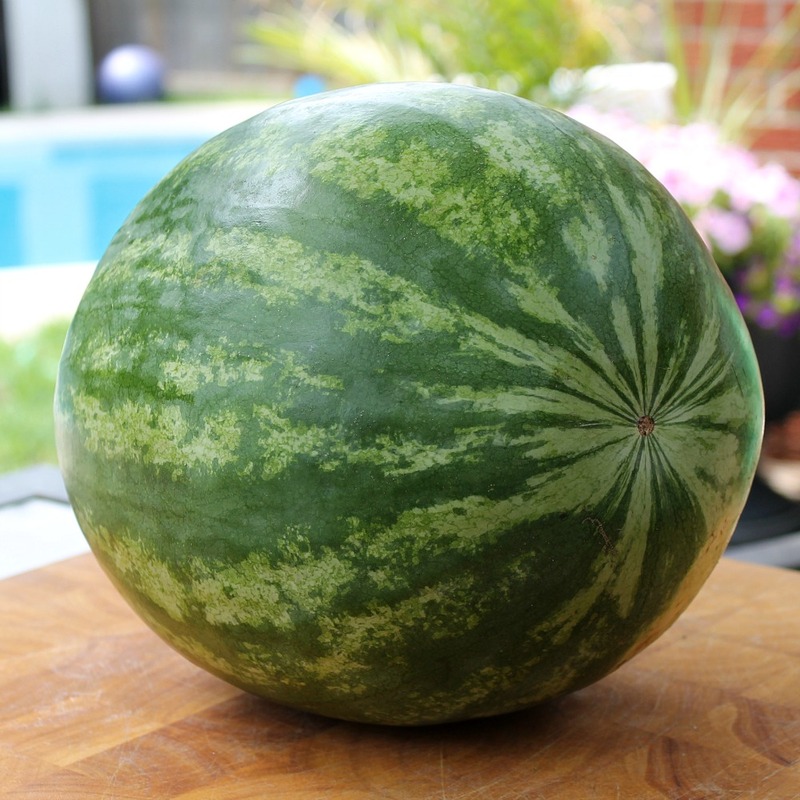 My husband recently brought home a watermelon and instantly my mind went back to an image I’d seen on Pinterest of a watermelon cake. Pinterest is a BIG thing with me, I love to save the photos for future use and today I had the chance to use one of my Pins. 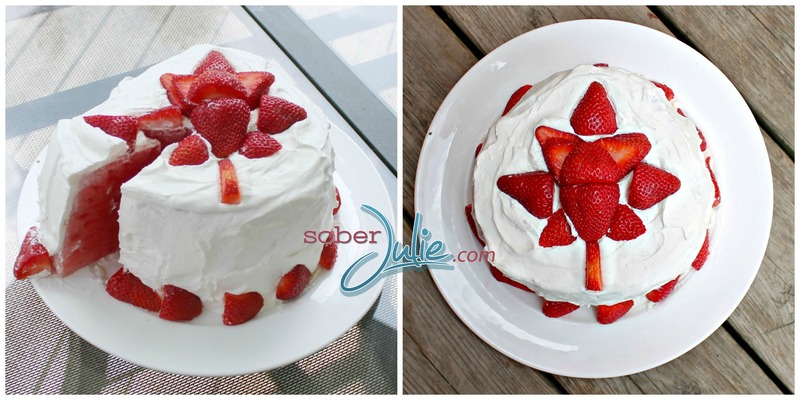 I did what any good Pinner should do, I went over to see the original blog which had posted the No Bake Watermelon Cake to see how to get this recipe off the ground. She had used her own whipped cream and I have a wonderful whipped cream recipe (posted within my Berry Rhubarb Parfait recipe) but I had 2 kids chomping at the bit this afternoon so decided to use the store-bought version in the fridge. This really is very simple, you could easily decorate it for whatever celebration you have coming up but we chose to do one for Canada Day and one for our friends in the US celebrating July 4th. You’ll need a good sized watermelon. 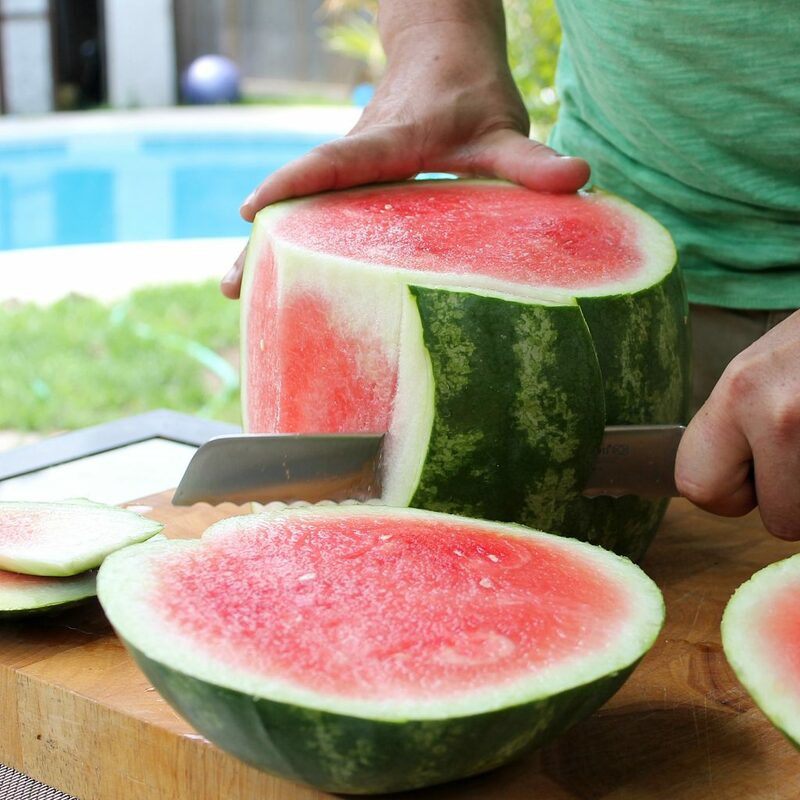 Cut off each end of the watermelon. You’ll be left with the center and now you cut off the skin and white bits. Whew all of this cutting is so much more simple when you recruit some help! 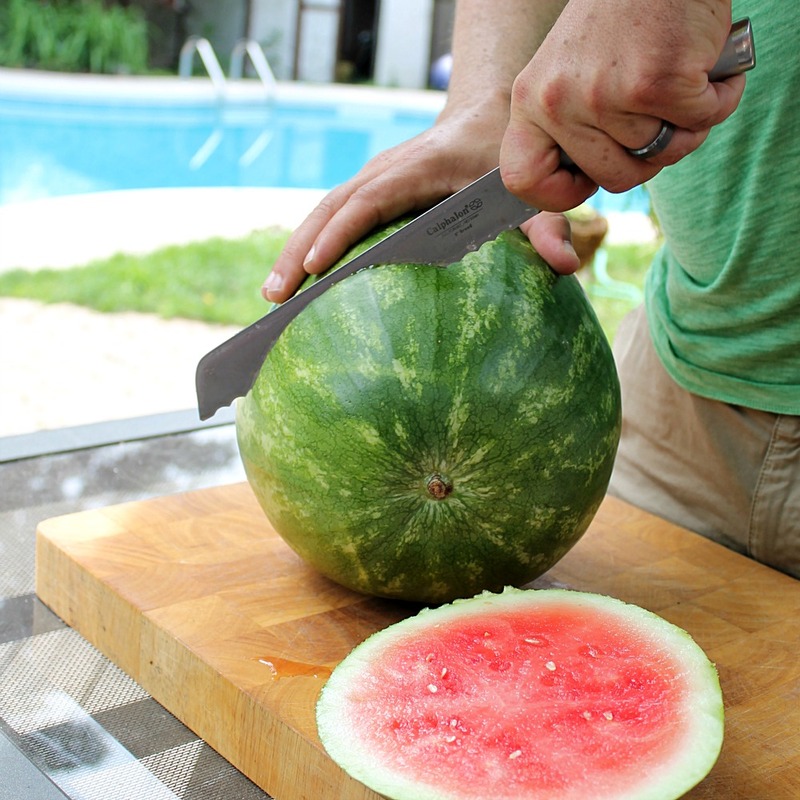 Place your watermelon on it’s flat side and trim it until you’re happy with the shape. The kids loved helping me use up the leftover bits of watermelon, they’re also good to use in a drink like my Watermelon Lemonade. 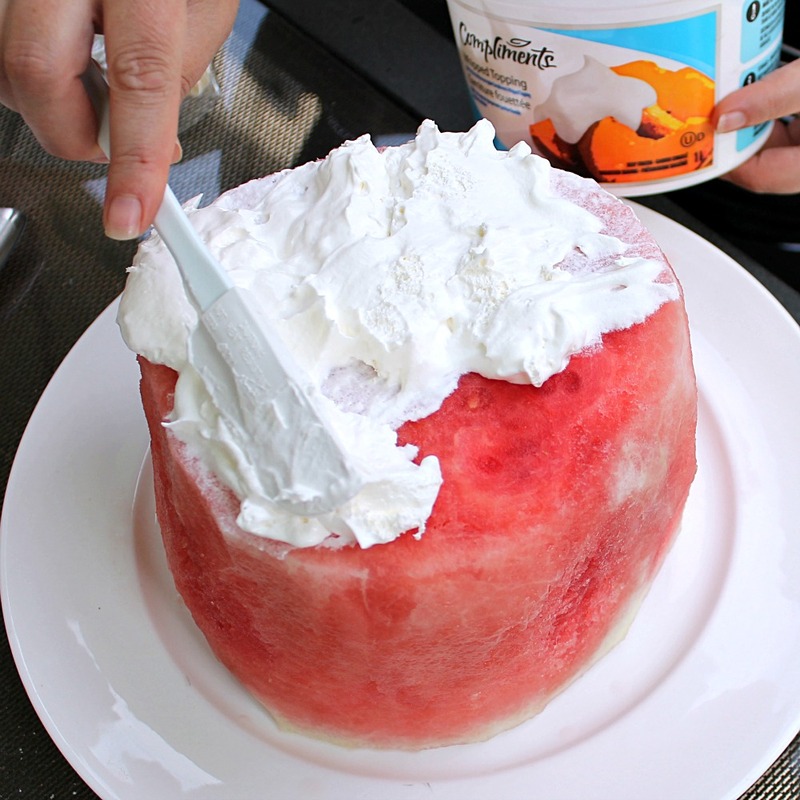 At this point you may want to put your watermelon into the fridge, it really was a bit difficult to get the whipped cream to stick to the watermelon and chilling it helps. Cover the entire watermelon in whipped cream as if you’re icing a cake. Now you simply add your choice of decorations. For my US July 4th cake I used blueberries and raspberries and for the Maple Leaf I used strawberries. 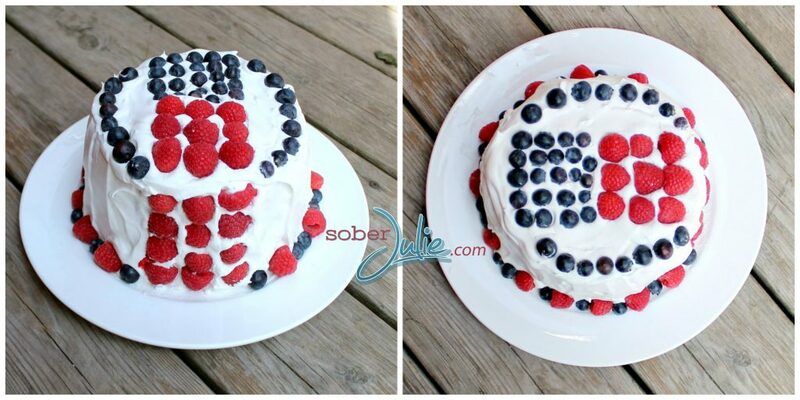 A simple dessert that looks super-festive! You are becoming very ery creative these days with your food.. Keep it up,I love it!! That looks good and I like the idea of it. That is so awesome!!! 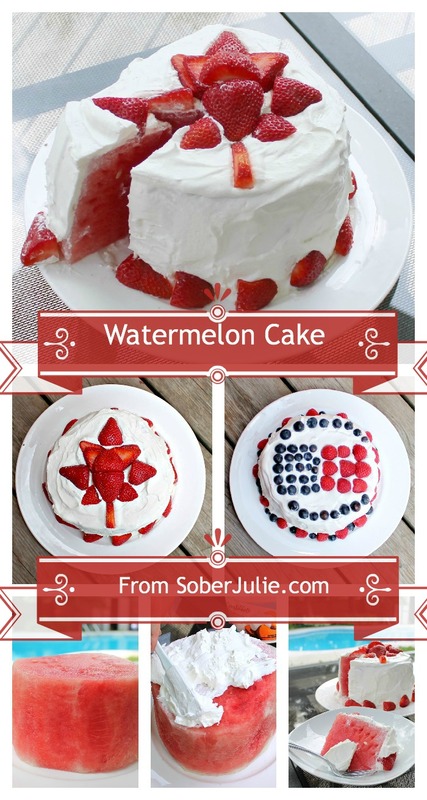 I make a watermelon cake with just fruit (pinned to the watermelon with toothpicks)! I had never thought of covering it in whipped cream! Love this idea! Very cool! I love the idea! So original and so pretty! I am going to add this to our Canada Day menu as my kids just adore watermelon. Thanks for the idea! Oh I’m so glad this post helped you Amanda!! 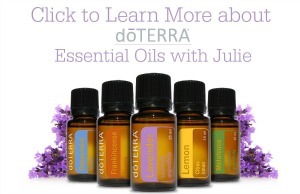 I love this idea, Julie! Yours turned out so well! This looks easy and fun! I can’t wait to try this with family for Canada’s 150 July 1st. Cheers!